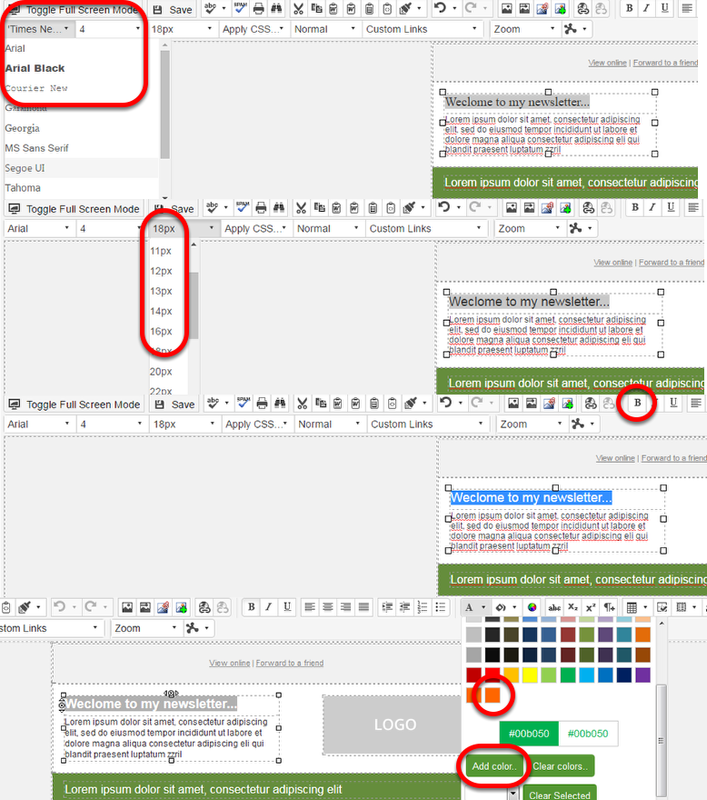 In this exercise we look at styling our email, adding and editing images, creating trackable links, utilising the properties barand inspecting the HTML bread crumb trail. Work your way through the steps with reference to the screenshots above them to complete the exercise. 2. Insert the template called ‘Editor Course’ from the ‘My Templates’ section. Add #5D9731 (Green) to the colour palette and set the title to this colour. 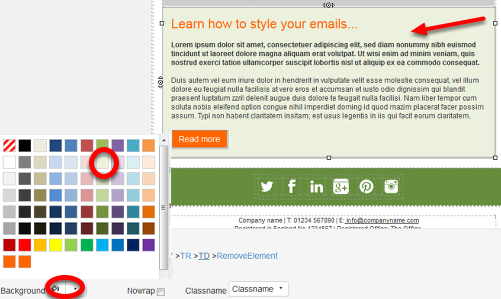 Apply the font colour of white (#ffffff) from the colour palette. Add #FF6600 (Orange) to the colour palette and apply this colour to the title. 6. 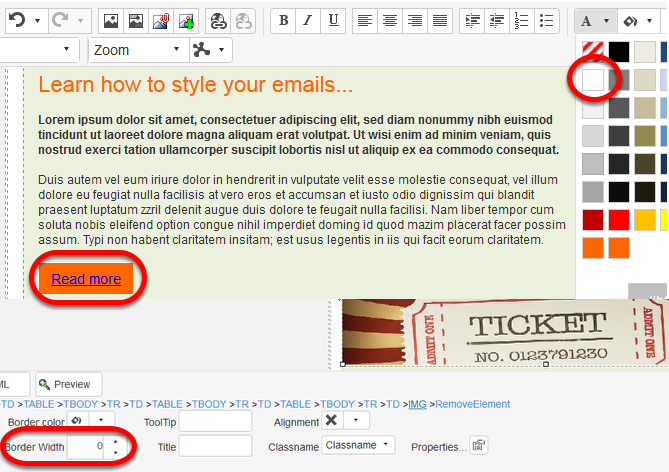 Go to a web page of your choosing and use the content to replace the text under 'Learn how to style your emails...' Use Notepad or the ‘Paste as Plain Text’ button to retain styling and format. Set the content of the cell to center alignment. Place your courser within the cell, select the table from the bread crumb trail and set the table to center alignment. With the table still selected, change the background colour to #FF6600 (Orange). 1. Select the logo image and delete it. 2. Select the Image Manager and locate the folder call 'Editor_Course_Training.' 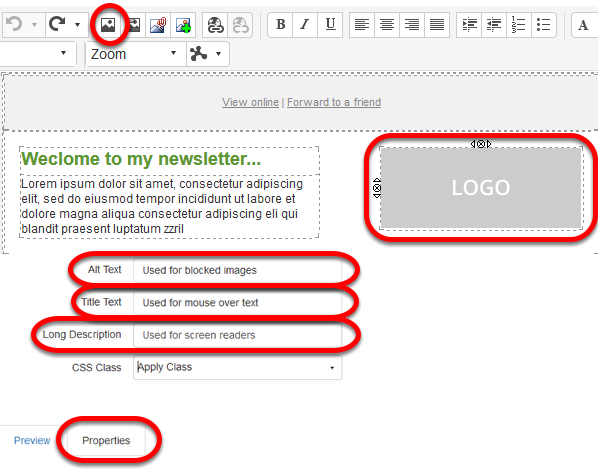 Select the properties tab and set the Alt text, Title text, Long Description to Gator Logo. 4. Select the image banner displayed as 570x200 (note the image size in the properties bar is not the same – this is due to borders being added in design view) always check your image sizes. 7. Resize the image to 570x199, add your name to the file extension, save and insert the image. 1. Select the 'Read More' text and create a link to your website ensuring to to using the 'Insert Web Link' icon located on the right hand side tool bar. 2. Change the link colour by placing your cursor within the link text (do not highlight) and select the font colour of white to change the link text back to its original colour. 3. Select the 'Golden Ticket' image and create another link to your website. After you have created the link, makes sure the image is selected and apply a border width of 0.